Two common iron compounds increase the formation of a known biomarker for cancer, according to a new study of cancer cells from Chalmers University of Technology, Sweden. The two compounds, ferric citrate and ferric EDTA, are often used in dietary supplements and as a food additive respectively, in worldwide markets including the USA and the EU. The researchers studied ferric citrate and ferric EDTA, which have both previously been shown to worsen tumour formation in mice with colon cancer. The science behind this has been little understood until now, and possible effects on human cells were not previously investigated. The new study, which was in collaboration with the UK Medical Research Council and Cambridge University, looked at the effect of normal supplemental doses of these compounds on two types of cultured human colon cancer cells. As a comparison, they also measured the effects of ferrous sulphate, another very commonly available iron compound. While ferrous sulphate had no effect, both ferric citrate and ferric EDTA caused an increase in cellular levels of amphiregulin, a biomarker for cancer. This was the case even at low doses. "We can conclude that ferric citrate and ferric EDTA might be carcinogenic, as they both increase the formation of amphiregulin, a known cancer marker most often associated with long-term cancer with poor prognosis," says Nathalie Scheers, Assistant Professor at Chalmers University of Technology, and lead writer on the study. Today there are many different types of iron supplements on the market. These can be based on at least 20 different iron compounds, and sold under a wide range of brands. Ferric sulphate is one of the most common, but ferric citrate, which is said to be gentler for the stomach, is also widely available in stores and online. It is also more easily absorbed by the body through foods such as granary bread, beans and nuts. "Many stores and suppliers don't actually state what kind of iron compound is present – even in pharmacies. Usually it just says 'iron' or 'iron mineral', which is problematic for consumers," says Nathalie Scheers. Iron is also added to some foods, to combat iron deficiency. Ferric EDTA is approved as a fortifying agent in both the USA and the EU. It is also used in countries such as China, Pakistan, Brazil, Mexico and The Philippines, where it is added to flour and powdered drinks. Additionally, it is present in certain medicines for children with low iron levels in countries such as the UK and France. "First, we must bear in mind that the study was done on human cancer cells cultured in the laboratory, since it would be unethical to do it in humans. But, the possible mechanisms and effects observed still call for caution. They must be further investigated," says Nathalie Scheers. "At the moment, people should still follow recommended medical advice. As a researcher, I cannot recommend anything – that advice needs to come from the authorities. But speaking personally, if I needed an iron supplement, I would try to avoid ferric citrate," she continues. Beyond this, she is not willing to comment. Research in the field has so far been limited, even concerning the more common ferrous sulphate. The key thing for her is that we begin to differentiate between different forms of iron. 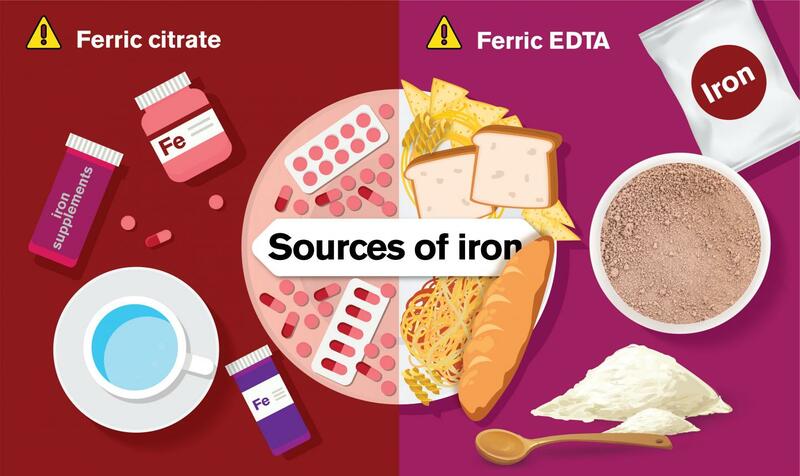 "Most importantly, researchers and authorities need to start to distinguish between this form of iron and that form of iron. We need to consider that different forms can have different biological effects," she concludes. Most of the iron that the body needs is obtained through food such as meat, fish, vegetables, fruits and whole grains. But sometimes this is not enough. Pregnant women may need additional iron, as well as people who have lost blood or have low haemoglobin levels for other reasons. In patients with kidney disease, high doses of iron may be needed to bind phosphates into the bloodstream. The research was funded by Formas, (The Swedish Research Council for Environment, Agricultural Sciences and Spatial Planning) and was in collaboration with a research team at Elsie Widdowson laboratory, Medical Research Council, Cambridge/University of Cambridge.